(Best English-language Book with an authentic Welsh background). "My pigeon’s gone missing. Seen him waddling about? Answers to the name of Mister Lloyd. Light grey feathers, dark underbelly. No? Yes? What? You think so? In which direction?" Where do you even begin to search for your lost pigeon? Of course you put up LOST posters, pinning them to as many tree trunks as possible and handing them out to people in the street, but it’s not like you can actually look for a pigeon... or can you? Mister Lloyd fails to return home from his first international race much to the distress of Mostyn Price, a young pigeon fancier from North Wales. His grandfather presumes he’s been devoured by a falcon but Mostyn is hell-bent on proving him wrong, determined to conquer his sense of loss, especially as his own dad also vanished a few years earlier. A mysterious tip-off suggests Mister Lloyd has landed in London and the search shifts to the metropolis where the 11-year-old hero finds himself increasingly isolated and in danger. 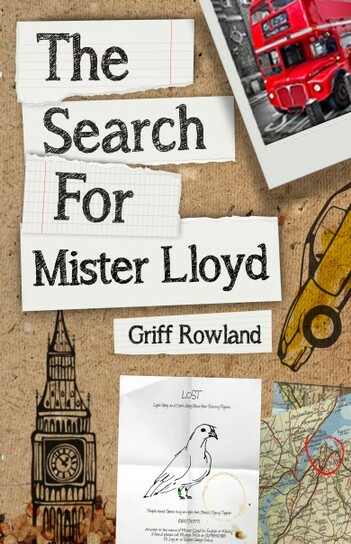 "In The Search for Mister Lloyd, Griff Rowlands has written a tale that draws you in from the start and never lets you go. It is touching, quirky, funny and sad, and has a cast of characters – pigeons included – who I suspect might be hard to forget. "- Suzy Ceulan Hughes, www.gwales.com, with the permission of the Welsh Books Council. The Search for Mister Lloyd is his first book.